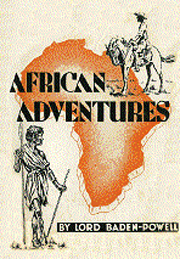 This is B-P’s own account of his journeys around Africa in 1937 and is scattered with reminiscences of earlier tours and his military service. The book is illustrated with simple, yet charming, black and white line drawings. On this visit the B-Ps visited sixteen ‘Scout Centres’ and on the return cruise, the Scouting communities on Ascension Island and St. Helena. There is no conclusion but a ‘Farewell’; B-P it must be remembered was 81 at the time. 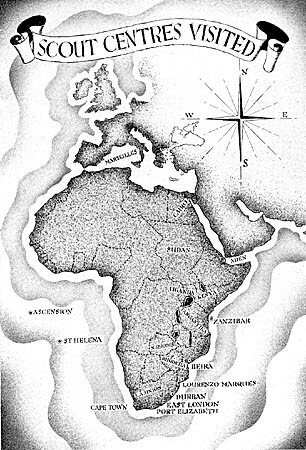 The ‘Farewell’ however is not so much a ‘last message’, more a giving of veiled notice of his intention to return to Africa to live. It’s not that far away says B-P "If you are in a hurry it only takes four and half days by air." The Scouting story continues down to the present day at the website of the Boy Scouts Association of Zimbabwe, Matabeleland Province and of the 1st Bulawayo (Pioneer) Scout Group. The Baden-Powell Library. A Selection of excerpts from the works of Lord Baden-Powell and works relating to his life and career.